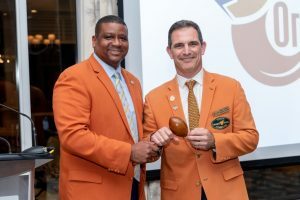 Miami Lakes, Fla. – Janaury, 29, 2019 – José C. Romano was installed as the Orange Bowl Committee’s 81st President and Chair on Tuesday, January 29, 2019 at Riviera Country Club in Coral Gables. Romano has been a member of the Orange Bowl Committee (OBC) since 2005 and succeeds Immediate Past President & Chair, Sean Pittman. Romano will oversee the Committee’s continued commitment to the South Florida community, including a full slate of events, highlighted by the Capital One Orange Bowl on January 1, 2020. The Orange Bowl invests more than $1 million in the South Florida community on an annual basis, funding a variety of community events, academic programs, scholarships and youth sports programs and initiatives. Additionally, over the last 11 years, Orange Bowl legacy gift projects in conjunction with local municipalities and partner support have resulted in nearly $16 million worth of improvements in five south Florida parks from Homestead to Belle Glade. Romano is the Chief Operating Officer (COO) of the Medical Center at Ocean Reef (MCOR), part of Baptist Health South Florida (BHSF), and Assistant Vice President, Baptist Health South Florida. As COO of MCOR, his role is to provide leadership in the development, implementation and oversight of standards, systems, policies and procedures in alignment with the organization’s strategic initiatives. He is also actively involved in the strategic analysis of service line expansion and financial planning. José is an experienced executive with a successful track record in developing go-to-market strategies for companies in a wide range of industries. He has experience in general management roles as well as functional expertise in marketing, market and financial analysis, corporate communications, business development, fundraising and strategic planning. Prior to joining Baptist Health, José was the Vice President of Sales & Marketing for Digital Signergy, a company that provides turnkey solutions for digital signage networks in targeted environments throughout the US and Latin America. José has also served as the Sales & Marketing Director at Sharp Electronics Latin America Group. Prior to Sharp, José held a number of marketing and sales positions at Miami-based companies, including GDA, S.A., The Miami Herald and Ryder System, Inc.
José has his MBA in Marketing from the University of Texas and an International Finance degree from Georgetown University. He serves on various community Boards, including The Zoo Miami Foundation as Chairman. Romano is a Trustee Member of the Greater Miami Chamber of Commerce and is Chairman of the Sports Committee. In addition, he was named to the CNC Board of Advisors and future Chair of the American Heart Association for Miami-Dade and Broward. José is an Orange Bowl legacy as his mother, Josie Romano Brown, is a senior member, having been elected to the committee in 1994. They were the first mother-son legacy in Orange Bowl history. José and his wife Joanna have three children ranging from 13 to 3 years old. He spends his free time with family and friends enjoying the outdoors; mostly fishing, mountain biking, camping and playing sports. Jeff E. Rubin moves into Romano’s former role as President-Elect and Chair-Elect and will serve as the 82nd President and Chair during the 2020-2021 year. John P. (Jack) Seiler will serve as the First Vice-Chair and will become President and Chair in 2021-2022. Eric L. Poms enters his 14th year as the Chief Executive Officer and marks his 26th year with the Orange Bowl Committee.